Design trends tend to be cyclical. That’s why you can see so many outdated design trends make their return from past decades with a contemporary look. 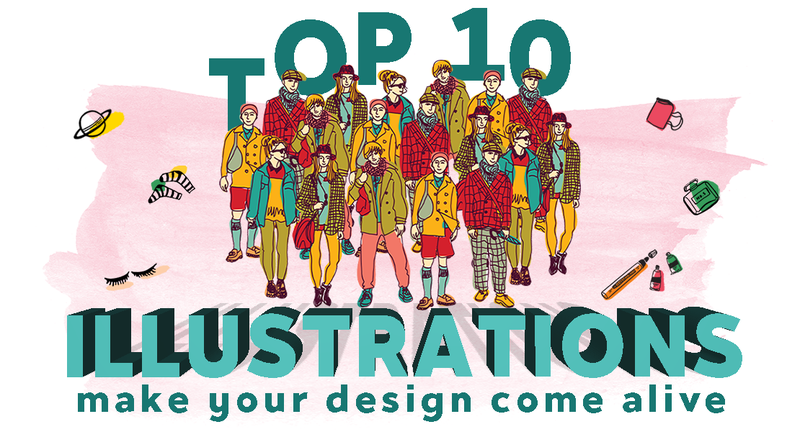 We do hope you will find your own inspiration through the top 10 illustration effects below. Some aren’t all that new, but can still wow your audience. Application: Think logically and strategically how your logo appears on all types of devices. The smaller the device, the more necessary it becomes to symbolize your logo, both graphic and illustration-wise. Want to breathe life into your designs? Go with hand drawn graphic elements, hand drawn add-ons, and hand drawn fonts. When the modern world’s digital life brings everything to you right through a flat screen, hand drawn elements easily win your customer’s heart because of its unique and personalized feel. As people say, everything old becomes new again. Designers, try to find the traditional touch in hand drawn and customize it in your illustrations to suit the digital world. And here’s how you can play with these icons in your design for your website. Scroll down, looks nice right? KlapauciusCo is so smart when using illustrations in order to show the 6 different typefaces of her font. You will need some skill in layouts to highlight what you wanna show in creative ways. Your audience won’t get bored of quirky and high-quality illustrations, that’s for sure! It’s not just a trick in design but also based on psychology – the more objects are repeated, the more memorable it becomes. And the truth is, it applies to many fields too not just design. Think about students applying formulas to memory while studying, a pattern in communication, and many more. So if you really need to emphasize a point in a design, just repeat the graphic elements. And somehow, it’ll always appear fashionable! Also, in some cases you don’t have to copy and paste exactly from the original. Make it as lively as you feel you need to! Design_Savchuk gained 4000 impressions in TheHungryJPEG’s Pinterest board on the first day of posing her Be a Woman object collection. Viewers love duplicate elements laid out in creative and unique ways. Check out her incredible work to spread ideas in your mind and inspire your designs now! Micro-interaction is commonly known as a movement in interface design such as the “Like” motion on Instagram, “Siri” motion of Apple, “Loading” motion of Google. Designers implement microinteraction through animation very often. Some big brands like Google, Uber, and AirBnb apply it very successfully. The fact is, they understand the psychology behind microinteractions. When people are satisfied at a certain stage after experiencing a microactive interface, a phenomenon happens called “Duration Neglect”. People can forget how long they have been on your website because of the PEAK-END rule. PEAK is about the moments that lead your emotions to the TOP as you browse a website. “ENDING OF EXPERIENCE” focuses on what the last experience that fulfills your audience about your site on the way out. Duration neglect does not have any effect without these two moments: Peak and End! This is when your micro-animation makes sense and serves to delight the viewer. It seems less restrictive than other styles. Abstract art allows your audience to interpret the meaning on their own. Abstraction just occurs to you when you begin working on a design – you can’t predict which direction it pushes you into. All your best ideas come out of the process. The most important thing to pay attention to when you work with quicky and abstract objects in design is the balance. Achieving a balance between elements, color and arrangement is both challenging and rewarding once you start with these styles. This trend in design will never grow old – when real objects are slid into the digital world to make things more realistic and more creative. Pick a selective illustration set and arrange them around your element of realia. You will need some add-ons. Think about effects like brushes, shadows, lines, and banners… to make your design more lively! And for sure, it’ll be unique. Enjoy other art works from OkayAnnie Designs! Want to make your design stand out? Use an illustration with a vibrant color! Nowadays designers love to use bright tones when they hope it would make their work more memorable in a very simple way. The thing is, using vibrant colors often seem risky because of their potentially overwhelming effect. So it has to be done with care and the appropriate balance. Here’s an idea if you’re looking to create a wow effect – throw in a bold and vibrant color amongst gentle and neutral tones. Vintage designs are not anything new. But based on the fans of this style on Pinterest these past months, it still keeps its reputation in our design world. Leading to the evidence, this vintage collection has received more than 15,000 impressions just for 3 days of pinning. Some brands who still prefer this classic design for their packaging figured out how to target their audience perfectly. Pop art gained popularity in Britain in the 1950s, quickly spread to America in the 1960s and then became a source of inspiration across the globe. This genre was developed by young artists who added slices of their real life into their art because they believed in the relevance and connection. If you notice in many Hollywood movie posters, pop art is a specific feature used when people think of their image. Identically, packaging, advertising, comic books or pop music is popular for this design. If you aren’t feeling like creating stuff using stock content, why not make use of custom illustrations? You’ll spark a connection among single elements in order to create an awesome design. Connection is important! That’s where you start creating a visual language which can really enhance and add personality to a brand. As Futureof.design shows us, they’re really good at custom illustrations. Check out their awesome report titled “Future of design in Start-Ups” for 2017. Every illustration displays the main idea creatively and what the creator wants to focus on. With so many styles out there, the design scene is about to get crazily creative in 2019! Gear up with these illustration tips and showcase the originality of your brand with your designs. Time to unlock your creativity – let all your crazy ideas come to life.